[SatNews] Thaicom marks the tenth anniversary of IPSTAR, the world's first High Throughput Satellite (HTS) and one of the catalysts of the huge shift the satellite industry has undergone over the past decade. When launched in 2005, IPSTAR was the heaviest commercial GEO satellite ever orbited, with a launch mass of nearly 6,500 kg. This was also the first satellite to achieve a maximum 45 Gbps of capacity and was one of the first commercial satellites to use electric propulsion. 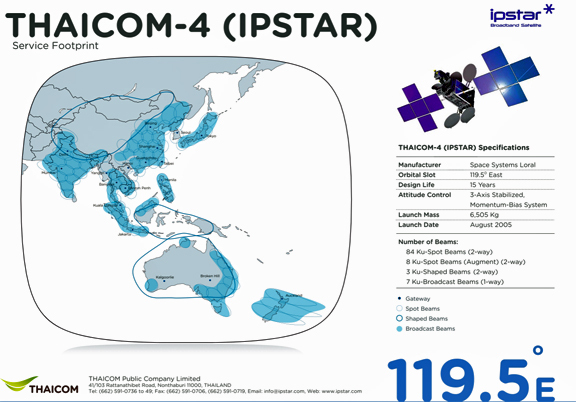 Since 2005, IPSTAR has been Asia-Pacific's leading broadband satellite platform and service, underlining Thaicom's innovative and pioneering role in the satellite industry. Designed for high-speed, two-way broadband communication over an IP platform, IPSTAR provides coverage over most of Asia-Pacific via multiple narrowly focused spot beams. As is typical of HTS, IPSTAR is capable of maximizing the available frequency for transmission and increases bandwidth by a factor of twenty when compared to traditional Ku-band satellites, resulting in more efficient operations. The technology, according to Thaicom's Chief Executive Officer Suphajee Suthumpun, kick-started a massive shift in the satellite industry and satellites' capabilities, enabling new services, such as the provision of high-speed broadband to previously underserved and unserved areas. IPSTAR has a successful track record of providing the region's telecom industry, businesses, homes and government administrations with cost-effective satellite broadband access, capacity and services. Whether empowering school children through access to online learning materials, backing up business operations or expanding cellular networks in low-density population markets, IPSTAR has helped remove distance barriers in Asia-Pacific. The satellite has also provided critical services such as Internet and telephone communications after numerous disasters, including the devastating Japanese earthquake and tsunami in 2011 and both the China and Christchurch earthquakes, among others. "Since the launch of IPSTAR, HTS has proven its staying-power with widespread use in a variety of broadband applications and, even after ten years, remains more relevant than ever," said Suthumpun. "With HTS having grown so popular, the satellite market must continue to evolve through the influence of new technology. Operators should expect to see increased demand for HTS in the future as consumers' expectations for fast, ubiquitous and cost-effective connectivity continue to grow. At Thaicom, we are pleased to have made such a significant contribution to this new era of satellite communications and remain committed to supporting what looks like a very bright future for HTS—both for the next ten years, and beyond."